August 1942. Corpus Christi, Texas. "Women from all fields have joined the production army. Miss Grace Weaver, a civil service worker at the Naval Air Base and a schoolteacher before the war, is doing her part for victory along with her brother, who is a flying instructor in the Army. 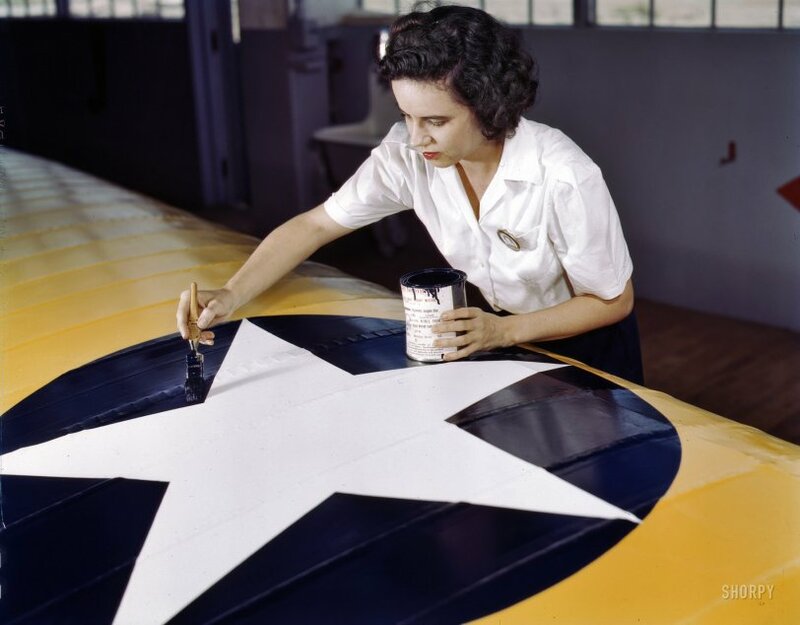 Miss Weaver paints the American insignia on repaired Navy plane wings." 4x5 Kodachrome transparency by Howard Hollem for the Office of War Information. View full size. Submitted by Thirdrail on Fri, 06/24/2011 - 4:57pm. This image (and all the OWI color images) makes me appreciate Kodachrome even more than I did. To last as many years as it has and still retain its color without shifting is nothing short of miraculous. It also brings up a question: What will happen to all of the family photos that are being taken by digital cameras these days in 50 years? Unless they are properly stored and cared for, a whole generation will lose its heritage. Submitted by Charlene on Wed, 06/15/2011 - 1:18pm. The rest of the star is bone dry. I wish I could find paint that dried within seconds of applying it. Submitted by Jay in Ohio on Tue, 06/14/2011 - 8:17pm. In addition to the immaculately white blouse and squeaky clean hands, from that position, with the extended arm, her brush strokes could not possibly have been that steady. Plus, she is setting the can on top of the fresh paint! No experienced painter does that. Call me a skeptic, but I'm convinced it is a staged shot. Nevertheless, she's easy on the eyes (in a 1940's kind of way), and I'm sure the real painter didn't look as nice. Submitted by Railsplitter on Tue, 06/14/2011 - 7:13pm. Applying blue paint while wearing a spotless white blouse. I wonder how long that will last. Submitted by ghostofwadelefler on Tue, 06/14/2011 - 2:53pm. I'm surprised to see no stencils or masking to keep her from getting the Insignia Blue paint on the white star. Taken with the spotlessness of her clothing as already noted and I have to imagine the photo as being staged. Submitted by Root 66 on Tue, 06/14/2011 - 12:54pm. Which is why she can stay inside the lines! A great photo for Flag Day. Submitted by Michael L on Tue, 06/14/2011 - 9:56am. Applying black paint while wearing a spotless white blouse. I wonder how long that will last. Submitted by huxley75 on Tue, 06/14/2011 - 9:35am. What a lovely image (color and composition-wise); and, sadly, one we won't see being made again any time soon with the demise of Kodachrome (and film in general) as a medium. No decals for me, thank you. Submitted by Maniak Productions on Tue, 06/14/2011 - 6:36am. That just might be a Grumbacher brush she's holding! Oh and I can smell the lead-based 1-shot lettering enamel and pure gum turpentine from here! Submitted by Mr Mel on Tue, 06/14/2011 - 6:36am. Amazing how she hasn't gotten paint on her hands or that white blouse.